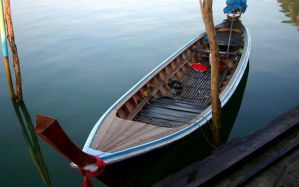 Phuket, a rainforested, mountainous island in the Andaman Sea. 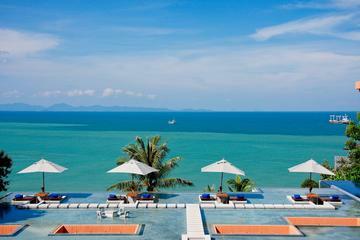 It has some of Thailand's most popular beaches, mostly situated along the clear waters of the western shore. The island is home to many high-end seaside resorts, spas and restaurants. Phuket City, the capital, has old shophouses and busy markets. The island of Phuket has long been misunderstood. Firstly, the 'h' is silent. And secondly, Phuket doesn't feel like an island at all. It's so huge (49km long, the biggest in Thailand) that you rarely feel surrounded by water, which is probably why Ko (�island') was dropped from its name. Branded the pearl of the Andaman, this is Thailand's original flavor of tailor-made fun in the sun. Ultimately, the island's affinity for luxury far outshines its other stereotypes. Jet-setters swing through in droves, getting pummeled during swanky spa sessions and sipping sundowners at fashion-forward nightspots or on rented yachts. And you don't have to be an heiress to tap into Phuket's style-packed to-do list. With deep-sea diving, high-end dining, luxury shopping, fabulous white beaches and some of Thailand's swankiest hotels at your fingertips, you might forget to leave. 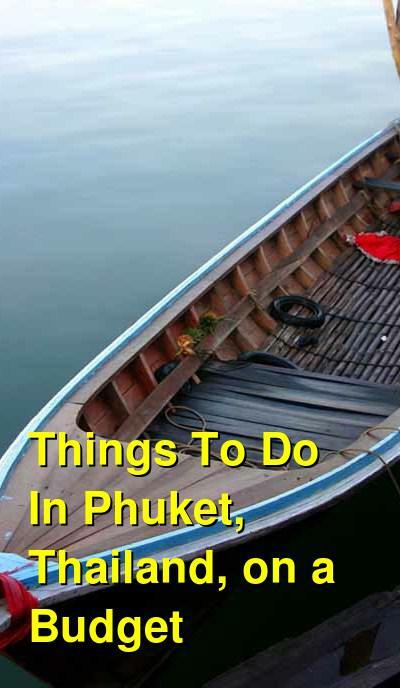 With so much to see and do, Phuket is a great place to experience, and there are several options for exciting activities and tours in or near the city. 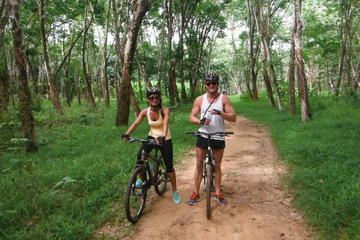 After hotel pickup in Phuket in the early morning, your driver transfers you to the northeast area of Phuket for your bike tour. Start by getting outfitted with a bike and helmet, then receive a safety briefing from your guide. When ready, set out on a leisurely ride that covers about 12 miles (20 km), taking both paved and unpaved roads with a few hills. Stop at the Gibbon Rehabilitation Center to learn about their work to rehabilitate captive gibbons and return them to the wild. Then pedal along country roads that wind past waterfalls and palm, pineapple, and rubber plantations, revealing a side of Phuket that remains unchanged, in contrast to the bustling tourism hubs on the island. The last section of the ride skirts the shores of Phang Nga Bay. At the end of the ride, your minivan driver meets you for the return transfer to your Phuket hotel. After hotel pickup, your tour starts with the transfer to the Ao Makham pier where you'll hop on a catamaran for the ride toward Maithon Island. Enjoy the fresh sea air and scenery while enjoying fruit and snacks served on board. When you arrive at the island, your captain cruises around in search of wild dolphins and then finds a spot for snorkeling. Back on the boat, continue sailing to Sri Panwa Phuket, a luxury pool villa hotel where you'll disembark at the private pier and make your way up to the Baba Pool Club. Take in the views and relax as you enjoy a set meal prepared by the chef, and then start the journey back to your departure point for the transfer to your hotel, ending your tour. Your aerial adventures begin with pickup at your Phuket hotel in the morning or afternoon, depending on the time slot that you select when booking. 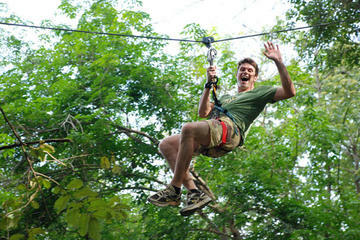 Drive out to the adventure park, situated in a lush forest near Phuket city. Meet your guide and receive a safety briefing and orientation, then put on the provided safety gear - including harness, double lanyard, two carabiners, a sling and pulley. Follow your guide to the beginning of the course. Climb up to the initial platform, then embark on your canopy adventure, crossing between platforms on a series of suspended walkways, nets, bridges and barrels. Designed for all ages to experience fun challenges, the course provides a playground for adults and children alike. Test your balance, strength and agility along the physically challenging course. Walk, swing, climb and balance from tree to tree for a bird's-eye view of nature. Your stamina is rewarded at the end of your outdoor workout with the grand finale: thrilling ziplines that take you back down to earth. Rest assured that a safety net supports your every move, and guides are on hand to offer assistance at 72 stations throughout the park. After approximately 3.5 hours, you're taken back to your hotel in Phuket. 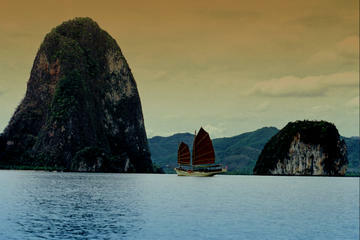 Spend a balmy evening soaking up a tropical sunset over Phang Nga Bay, starting with hotel pickup in Phuket. Once you're transferred to the Yacht Haven Marina, board the June Bahtra for your dinner cruise. As the traditional Chinese junk glides past the moored yachts and sets sail for Phang Nga Bay, take a seat in the alcove and relax to atmospheric music from the boat's sound system. Savor a five-course dinner buffet accompanied by wine. You're served mouthwatering Thai dishes such as om yam goong (hot and sour soup with prawns), whole steamed fish with rice, cashew chicken and fried vegetables. Soak up the serenity as you cruise to Ko Lawa to watch the sunset without the crowds. Focus your camera lens on the last rays of sun casting their colors over the limestone cliff-studded waters strewn with hidden lagoons. End your memorable evening with a return to the marina for ground transport back to your hotel.